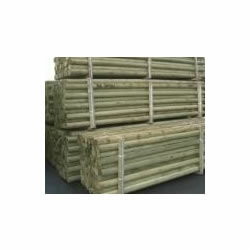 10 pack of 1.65m high x 75mm dia. wooden machine rounded timber stakes are used as fencing stakes and posts, tree stakes and garden stakes. Green tanalised wood (pressure treated) for long life. Ideal for any fencing job.